Disclaimer: This story is overflowing with cat puns. A-paw-logizing in advance for the complete lack of restraint. It's going to take much more than an angry tweet from Donald Trump to throw his newest political opponent off balance. 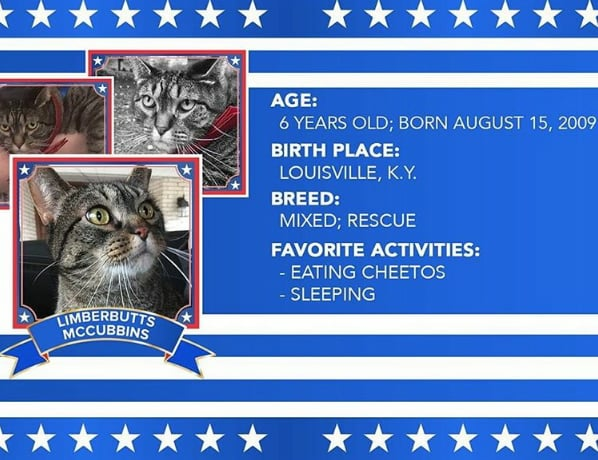 As reported initially by the Washington Post, 6-year-old cat Limberbutt McCubbins has officially entered the 2016 Presidential race as a self-proclaimed "Demo-cat-ic" candidate (see: disclaimer), aiming to capitalize on prospective third paw-ty voters. As of the latest Rasmussen Reports weekly poll, at least five percent of voters remain undecided, leaving ample op-pawtunity for Limberbutt to disrupt this race and earn the necessary 15 percent to secure a spot on the ballot. Though McCubbins' grassroots campaign has garnered online paw-pularity thanks to his viral slogan, "the time is meow," both the candidate and his campaign manager, Isaac Weiss, believe the path to victory will be rocky at best. Weiss tells POPSUGAR via email, "Limberbutt understands that he most likely won't win this election. He, instead, would like to use his platform to inform his followers about campaign issues and the importance of casting a vote on both on- and off-year elections." Weiss ultimately hopes young, enthusiastic Limberbutt supporters will choose to cast a vote for a human candidate this year, explaining to the Washington Post, "Limberbutt, for them, is an outlet to voice their frustrations and have a political discussion with a true outsider and hopeful Washington fat cat." 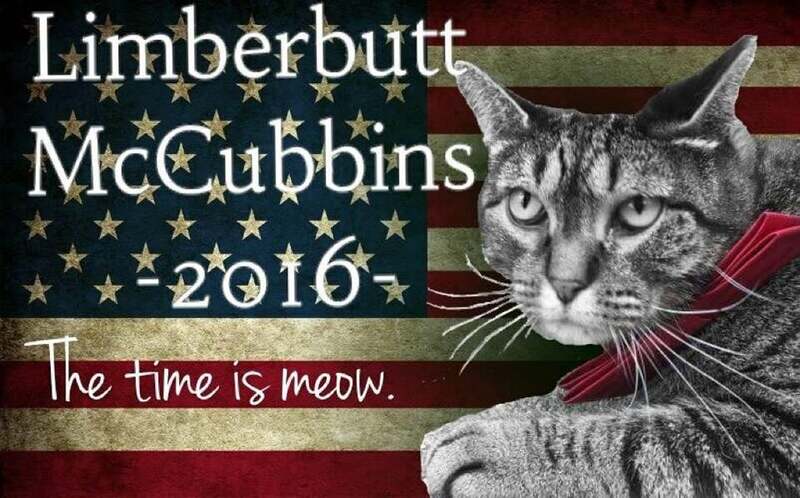 Curious cats and interested voters can find a painstakingly thorough list of Limberbutt's campaign platforms, including affordable healthcare and "a return to cat space flight", on his official campaign website. In a thinly veiled effort to acquire the vote of his fellow felines, the Limberbutt campaign site also lists a printable version of the nominee's favorite tuna casserole. I love puns. I also love p-nut butter, bacon, and both of my cats. Just thought you might want to know. Bacon good, cats good - two outta three ain't bad. Here was my choice for president in 1988. I had a tee, poster, and campaign literature. Look, up in the sky: 'Super Trump II' to hit NYC » « What do you call Santa’s helpers?